When late November arrives in Central Ohio one subject dominates the news, and takes center stage in the thoughts and minds of many residents. I’m not referring to Thanksgiving or the ridiculous shopping spectacle that used to occur the day after Thanksgiving, but now lasts longer than Bill Belichick’s tenure as head coach of the NY Jets , nor am I referring to the release of St. Bernardus Christmas Ale or Goose Island’s Bourbon County Brand Stout. No, I’m talking about a football rivalry that is simply referred to as The Game—Ohio State vs. Michigan for those not in the know. People around here are crazy about “The Game”. For example, Ohio State students spontaneously jump en masse into frigid Mirror Lake one night on the week leading up to the game. At this time of the year one can expect all kinds of Ohio State vs. Michigan activities including blood drives, food drives, and cattle drives . So I thought why not take all of this frenzy and direct it toward a worthwhile cause. While blood for the sick or food for the poor are noble causes, it seems like those needs are being taken care of, but no one is looking out for beer. You might be saying that beer is already a part of the tradition, otherwise how do you explain the fact that the ammonia concentration in Mirror Lake jumps by a factor of eight when all of the students take the plunge ? Still I think there is room to elevate discussion above the level of metabolized Natty Lite. 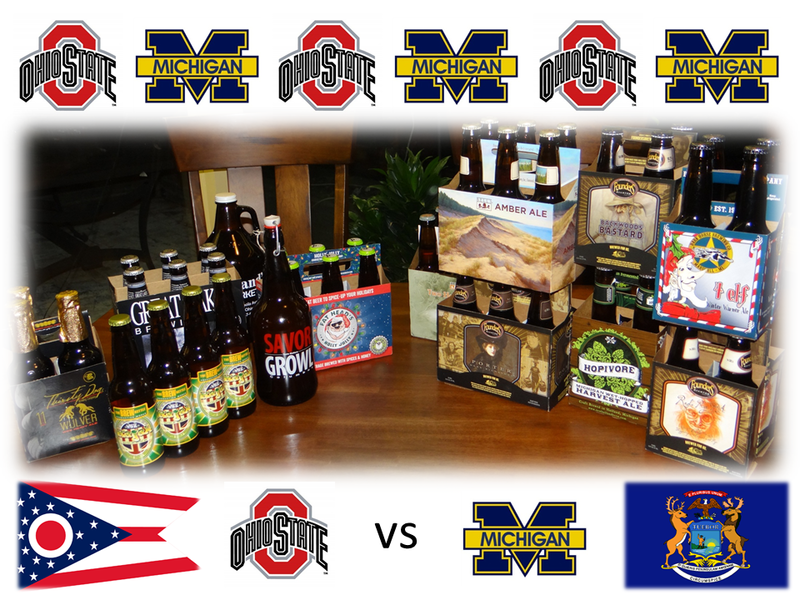 So I’ve organized a contest pitting beers from Ohio vs comparable beers from that state up north. Before jumping into the beers (not literally) I’m going to take a moment to throw out some trivia about The Game for all of my followers in South Korea and the Philippines . Ohio and Michigan fought a border war called the Toledo War in 1835-1836 . Basically the dispute was over a narrow strip of land running along the entire length of the border between the two states and now containing Toledo. The land was eventually given to Ohio in exchange for Michigan being granted statehood and 75% of the Upper Peninsula. Even though they officially lost, Michigan seems to have gotten the better end of that deal. The first game was played in 1897 and won 34-0 by Michigan. Ohio State didn’t fare well in the early days of the rivalry, not winning for the first time until 1919. 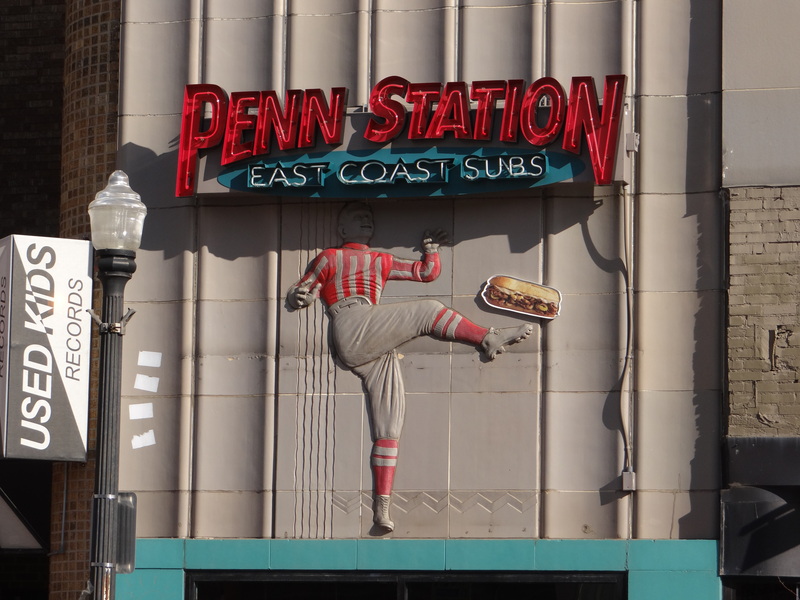 In that game they were led by legendary halfback Chic Harley, whose exploits are commemorated with a statue that now sits over the entrance to the Penn Station sub shop on High Street. The 1950 game, dubbed the Snow Bowl was played in a major blizzard. Ohio State didn’t make a single first down and their Heisman trophy winner, Vic Janowitz, punted 21 times for 685 yards. Michigan won the game 9-3 scoring all of their points on blocked punts. Ohio State coach Wes Fesler subsequently resigned and was replaced by legendary coach Woody Hayes. In 2000 ESPN dubbed the OSU-Michigan game as the #1 sports rivalry in North America. In 2006 both schools were undefeated and ranked #1 and #2 in the polls coming into the game. Ohio State won 42-39. I’ll spare all of my Ohio readers a discussion of the bowl game that immediately followed that historic victory. Among games played in the 21st century Ohio State has won nine times and Michigan only twice. Enough about football already, let’s get to the beer. There are eight rounds, each pitting a beer from Ohio against a similar style beer from Michigan. The eight beers representing Ohio come from eight different breweries. It is more difficult to get beers from the smaller Michigan breweries here in Ohio, so there is less diversity on the Michigan team, but still five different Michigan breweries are represented. Of the 16 beers in the contest, ten are ones I’ve not tried before. My thanks go out to Brad and Rin at Savor Market for pointing me to some excellent beers that I was previously unfamiliar with. Some of the Ohio beers (Wiley Wolverine and Bodhi) are only available on tap. Thanks to Savor Growl and the Ohio Tap Room for growler fills of these two fine beers. In each round I give you two perspectives on the winner. I threw a party and invited a dozen friends to judge the beers . We proceeded to carry out eight sequential blind taste tests. After each round we shot a short video to discuss the beers and count the secret ballot vote. I call this method the People’s Pick. Since there was an even number of judges a tie is a possible outcome, just like it was in the old days of college football. Thanks to my wife and daughter for help in pouring and serving the beers so that we could all taste them blind. As the night progressed I realized that a little less than half of the twelve “judges” were averse to bitter, hoppy beer. This calls into question their judgment in some of the rounds. You can’t hardly trust a judge who chooses the winner of an IPA contest based on which one is less bitter. So I made the sacrifice of personally tasting the beers side by side and making my personal pick for the best beer. In most of the cases this was not done blind because the beers were different enough I could easily tell them apart. I call the winner chosen by this method Pat’s Pick. Depending on your affinity for beer you can decide which opinion best represents your tastes. Better yet pick up each beer, try it for yourself, and leave a comment here to register your own vote for the winner. I’ll be posting one round per day leading up to the game, starting today with Round 1 and finishing on the day of The Game with Round 8. I hope you enjoy the series and I encourage you to post comments with your own thoughts on these beers, suggestions for alternate matchups, or worthless pieces of trivia. I’m having a little trouble finding a reliable reference on the OSU vs. Michigan Cattle Drive. Although this seems like a poor attempt at humor the WordPress statistics show that I do regularly get hits from each of these countries. My guess is that I have one unofficial follower in each country. The term “friends” is used loosely here. I had actually only met 8 of the 12 people before the party started. The other four were friends or relatives of my friends. All of them were super nice people and fun to have at the party. There were a few moments when one might question their taste in beer, but then again they might say the same thing about me. This is a great idea! As a born Buckeye, I’m pulling for Ohio. Sports rivalry aside, I’d say this is a good up-and-comer David (Ohio) vs the established Goliath (Michigan). Very curious to see how this pans out. It was a lot of fun to do, and the race stays pretty close all the way through. I completely agree with your assessment, Michigan beers have been on the map for longer, but Ohio has been closing the gap in recent years.